Dave Warnes has been cave diving for about 50 years. At age 75 he is the oldest active cave diver in Australia. 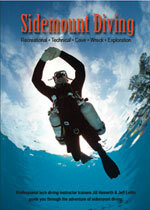 Dave started cave diving in the Lower South East in the 1960's. He sat on the steering committee for the development of cave diving standards after a series of cave diving fatalities in the late 60's and early 70's. Dave was elected the founding president of the Cave Divers Association of Australia and holds life membership with that organisation. He was responsible for discovery and exploration of a number of caves in the Lower South East and on the Nullarbor. In this interview with Greg Bulling, Dave recalls some of the history of cave diving in Australia and discusses how cave diving equipment has changed over 50 years.